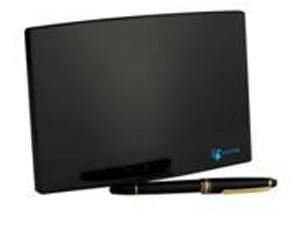 NXP Semiconductors and NorthVu Systems Inc. (NorthVu) recently announced that they have collaborated to bring the smallest high-performance indoor digital TV antenna to market. The NorthVu NV20 Pro is 40% smaller than comparable products while delivering superior reception and range, enabling consumers to enjoy stunning digital HD broadcast TV, also known as over-the-air or digital terrestrial television. At just 8.1" x 5.25" x 1.85", the NV20 Pro receives digital 1080p HD television signals directly off-air, and it features an integrated state-of-the-art LNA (low-noise amplifier) based on NXP's industry-leading silicon-germanium low-noise transistor, the BFU760F, significantly enhancing the quality and reliability of the signals received. The BFU760F is a member of NXP's family of bipolar SiGe and SiGe:C LNA devices, which offer exceptional RF noise figure versus gain performance, while drawing very low current. This performance allows for better signal reception at low power and enables RF receivers to operate more robustly in noisy environments. They also have the advantage of superior ESD robustness over competing GaAs LNA solutions. NorthVu incorporated NXP's low-noise transistor technology into the NV20 Pro to increase its signal range to up to 35 miles and improve overall picture reception. Optimized to receive VHF, UHF and digital FM signals, consumers can receive a wide selection of digital broadcast TV channels on a device that is compact and discrete compared to competing products. Erick Olsen, marketing director for RF small signal at NXP Semiconductors, said: "This product is a great validation of our expertise in the small signal, low current requirements of wideband applications. The combination of NorthVu Systems' patent-pending technology with our industry-proven LNA solution has delivered a high-performance digital TV antenna in an industry-first compact form-factor. The exceptional performance parameters of the BFU760F – such as ruggedness, reliability, low noise and high level of integration – make it an ideal solution for this type of innovative RF product." Spenser Williams, president of NorthVu Systems Inc., commented: "Consumers will be amazed by the reception quality of the NV20 Pro. It is simple to use with their HDTV, digital converter box, or computer with a TV tuner, with no assembly required. Using NXP's advanced RF technology platform, we have succeeded in creating the smallest high performance indoor digital TV antenna. NXP also did a great job of supporting us throughout the development of the NV20 Pro, quickly delivering multiple amplifier design iterations as we fine-tuned the design specifications for the product." NorthVu Systems Inc. was founded with the idea that consumer electronic products should be simple to use, look great, and fit seamlessly into the home. NorthVu develops innovative products that enable consumers to enjoy cloud-based video content and "free" digital broadcast TV services. NorthVu's products combine creative design with technology, decades of industry experience, a leading portfolio of global patents, and strong relationships with motivated partners and ecosystem stakeholders. NorthVu provides licensing opportunities to original equipment and/or design manufacturers, private label brand, and distributor clients worldwide and enjoys a growing network of long-lasting relationships with leading brands. For more information, visit www.northvu.com. NXP Semiconductors N.V. provides High Performance Mixed Signal and Standard Product solutions that leverage its leading RF, Analog, Power Management, Interface, Security and Digital Processing expertise. These innovations are used in a wide range of automotive, identification, wireless infrastructure, lighting, industrial, mobile, consumer and computing applications. A global semiconductor company with operations in more than 25 countries, NXP posted revenue of $4.4B in 2010. For more information, visit www.nxp.com.